Able to carry 300 lbs. When I first saw these hand trucks 8 years ago, I thought they would not stand up to the work we do. I have never been so wrong. When I took a new position, I ordered two Super 600s, and everyone doubted that they would be able to haul up to 10 boxes of documents. No one doubts them now, just a month later, and no one wants to use the old Magliner, which is heavy and does not fit into anything smaller than a van. The Super 600 carries as much as our delivery vehicles normally need to carry, and then folds up to ride along, and then quickly unfolds to complete the delivery no fuss, no muss. There are no more practical, useful, easy to use tools available for our operation. SUPER 600 GREAT HAND TRUCK!!!!!!! THIS HAND TRUCK IS GREAT! MY COWORKERS ALWAYS COMENT ON THE LENGTH OF THE HANDLE.VERY EASY TO WALK WITH,NO BENDING WHILE WALKING!!! The 600 models are perfect for our world. We support a large area of users for their PC needs and these carts can handle it all. I purchase IT items for Superior Court and our techs in the field use and love this cart. So, I got one for home use and I love it. It can carry a big load, then it so easily folds down to a small size so is easy to store and transport. It is worth it's weight in gold! These carts are wonderful. They are very durable and easy to use. These carts are awesome. They never break down and are totakkt dependable. The only trouble I have with them is that people borrow them and never return them. 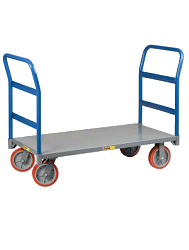 If you are looking for a dependable cart that can hold lots of weight this is your cart. I use this for my amps, bags, I've even strapped my guitar to the front with the handy fixed bungie cords attached. It's been the best tool for loading and unloading, I have ever owned. good for portable tubs over 50 lbs and collaspable for vehicle storage, however easy to bend which makes it hard to fold if abuse enough. I have 6 of them. We have had our folding cart for years and use it almost every day. When it was finally damaged after years of use, we ordered a new one and it is even better than the old one. keep up the good work! Good sturdy kartbut it didn't work to carry my celtic harp. IT IS GREAT, THIS IS MY SECOND ONE IN FIFTEEN YEARS. they are very durable and they can be repaired for less taht $60. We now have five carts in our inventory and have been purchasing them since before 1999. I love this cart! I've suggested it to others who need something similar. I am a big fan of the Super 600. My first is more than 15 years old, has been around the world countless times, has been mistreated, and is still going strong. It is the very best. I did buy the handtruck to pull my products to /from craft shows plus I do volunteer work and wanted it for my files. I bought plastic bins to fit on it, and so far I like it very much. I recommend it. I'm an amateur musician, my primary instrument is the baritone saxophone. The bari is a large and cumbersome instrument to lug around, especially when you also have to carry a music stand, clarinet, gig bag and maybe another sax. Recently I got tired of killing myself and spent a lot of money on a bari case with wheels. I wasn't satified. Then someone told me about Hand Trucks 'R' Us. I went online and wow, I couldn't believe the selection. I selected the Remin KartABag Super 600. It's perfect for my needs. It's well made and I couldn't be happier. I would recommend the Super 600 and Hand Trucks 'R' Us to my friends. I have been using the Super 600 for a month now and it really does a good job. I have to transport heavy boxes from my vehicle to my customer' offices and the 600 makes it so easy. This cart is amazing. I am often transporting items up to 300 lbs. and this cart allows a very easy transport along with ease of security. Recommend 100%!! !